A Giant Among Dinosaurs, Discovered In Argentina : The Two-Way The jumbo titanosaur would stretch the length of a pro basketball court, plus 40 feet, and stand as tall as a seven-story building. 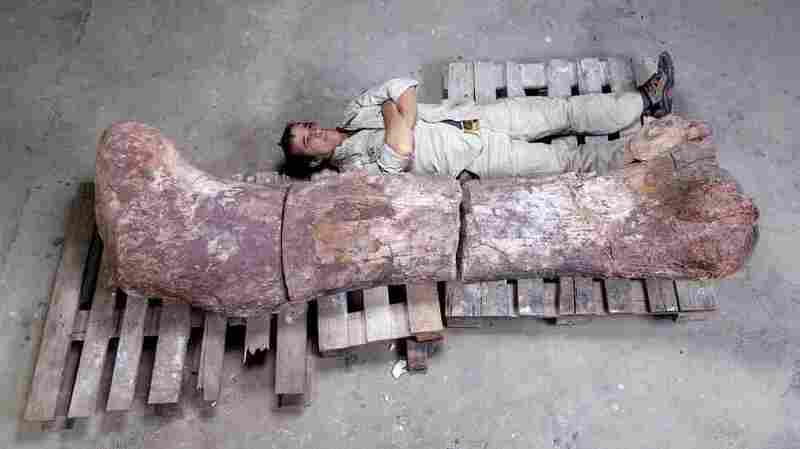 Pablo Puerta of the Museo Paleontologico Egidio Feruglio lies alongside a sauropod dinosaur femur. Paleontologists from the museum have announced the discovery of a new species of titanosaur, the largest animals known to walk the Earth. 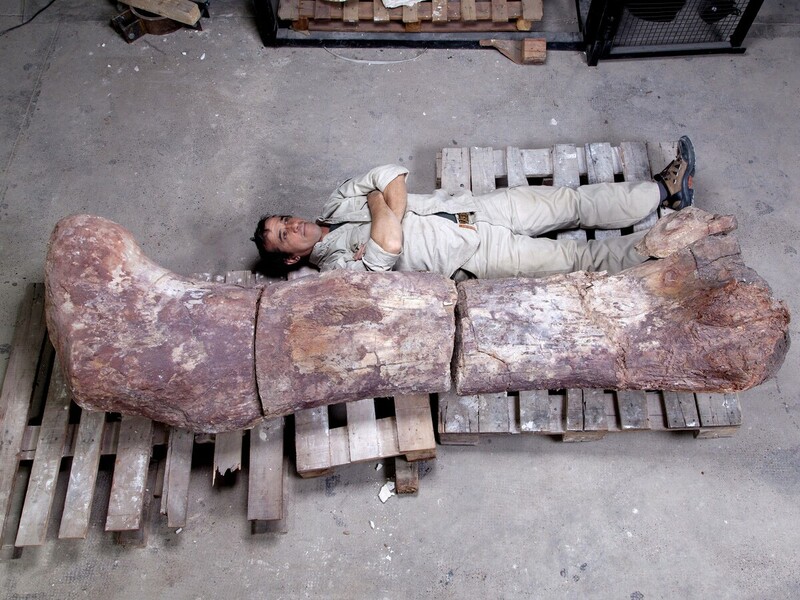 Paleontologists in Argentina say they have unearthed the fossils of the biggest dinosaur ever to walk the planet. The bones are believed to be from a new species of the aptly named titanosaur, a massive herbivore from the late Cretaceous period, officials from the Museo Paleontologico Egidio Feruglio told BBC News. The titanosaur was a sauropod, like the apatosaurus or brachiosaurus, that roamed the forests of Patagonia 95 million years ago. Based on the size of the largest thigh bones, the scientists calculated that the titanosaur weighed around 170,000 pounds and measured 130 feet long and 65 feet tall. "It's like two trucks with a trailer each, one in front of the other, and the weight of 14 elephants together," said Jose Luis Carballido, a dinosaur specialist at the museum, CNN reported. The Two-Way wondered what else on Earth compares to that gargantuan size. Imagine a professional basketball court: Not even three-quarters of the beast's length would fit, with the remaining 40 feet hanging out in the seats behind the basket. According to the museum's estimates, the creature weighed some 5,000 pounds more than a Boeing 737's maximum takeoff weight, and would have stretched a half-foot longer than the airplane. The jumbo titanosaur would have been about as tall as the Great Sphinx at Giza, something like the height of a seven-story building. The blue whale has the new sauropod beat, however. Though the ocean mammal is shorter by about 30 feet, the largest blue whales are estimated to weigh as much as 320,000 pounds. To be fair, the blue whale never has to support its bulk on land. The site of the discovery in Argentina holds the remains of seven dinosaurs, about 150 bones total. The site was discovered by a farmer in 2011 in the desert near La Flecha, near Trelew, Patagonia, said The Telegraph. The size of the previous holder of the title of world's largest dinosaur, the Argentinosaurus, was calculated from just a few bones, as opposed to the treasure trove just revealed, the BBC explains. "Originally thought to weigh in at 100 tonnes, [Argentinosaurus] was later revised down to about 70 tonnes — just under the 77 tonnes that this new sauropod is thought to have weighed," the BBC reports. The new titanosaur still needs a name, one befitting its monumental dimensions. "It will be named describing its magnificence and in honor to both the region and the farm owners who alerted us about the discovery," the researchers told the BBC.